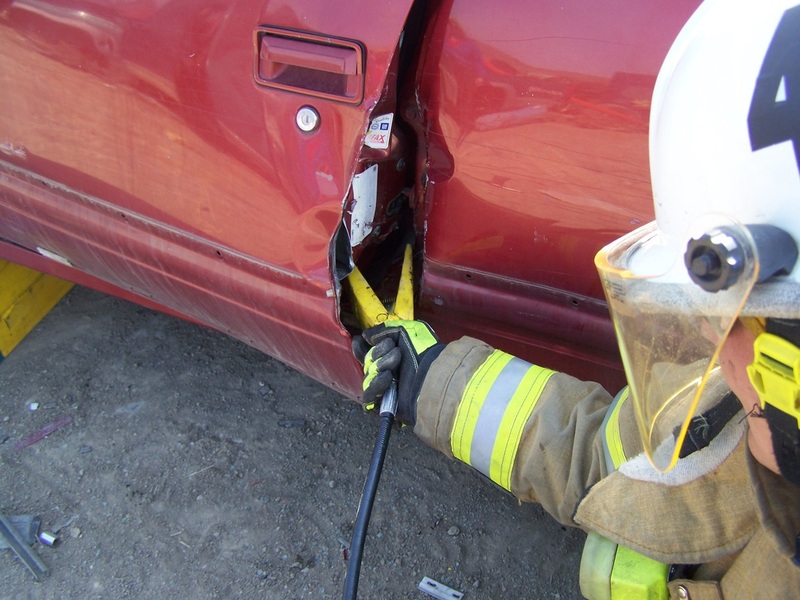 The RS-10 is a complete extrication tool set that will provide you with the ability to accomplish 99% of your vehicle extrication and rescue needs. It is the ideal rescue tool set for automobile, industrial and farm extrication, structure collapse and construction releases. This compact rescue tool set has a shipping weight of 150 lbs and comes in a heavy duty, 16 gauge steel storage box with a 2” deep small tool tray, two lockable / sealable latches and large heavy duty folding handles on each end. The RS-10 Rescue Tool Set is utilized in vehicle extrication to open damaged car doors, raise clutch and brake pedals, l using the hydraulic spreader and hydraulic wedge in combination. 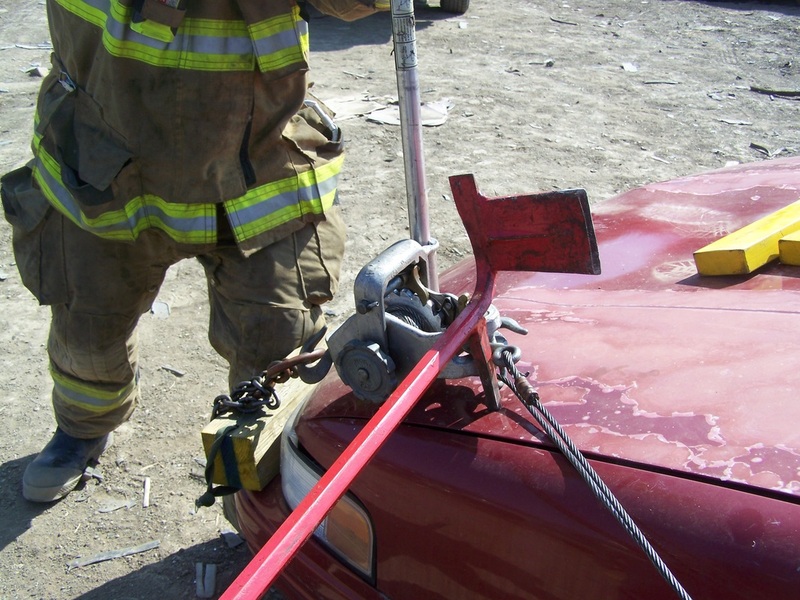 The hydraulic ram with adapters is used to raise the dashboard, move seats, push the firewall, raise the roof and move objects to permit extrication of the victim. 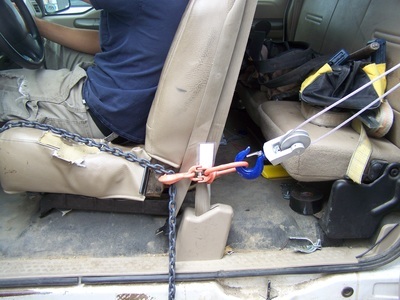 The 2 ton cable Come-A-Long and Rescue Chain Set are used in combination to pull seats, doors, steering columns, brake and clutch pedals, to roll dashboards and body panels out of the way, creating 3 door cars out of 2 door vehicles, to provide easy access to patients allowing easy removal of patients from the rear seat of two door cars. “The Original EXTRICATOR® RS-10 Rescue Tool Set” designed in 1964 to provide first responders with a set of tools designed to remove the vehicle from around the patient. This tried and true rescue set has recently been completely redesigned and upgraded to provide high efficiency pumps, more metal moving power, along with faster operation and easier maintenance. The new features include completely redesigned, heavy duty, high speed H2T steel pumps providing three times faster tool operation and greater reliability in tough rescue applications. New features include vertical or horizontal pump operation, larger hydraulic fluid reservoir, high flow pump piston combined with new high flow, hydraulic quick couplings, combine to provide more rapid tool operation with fewer pump strokes. The hydraulic reservoir fill port has been relocated to the top of the reservoir for easy inspection and refilling without the need for previously needed special filling stands. An internal pressure relief valve in the pump provides overload protection complying with OSHA, ANSI/ASME B30.1 Safety Standards. The new larger hydraulic fluid control valve has been designed for easy operation while wearing gloves. A longer pump handle with ergonomic grip has been incorporated into the design to provide a better stability, grip and ease of operation. The ram extension tubes have been improved with knurled surfaces to provide better grip in wet conditions or while wearing gloves. The ram extension tubes capacity has been increased to 5 tons. The updated RS-10 Rescue Tool Set includes completely redesigned, upgraded and improved hydraulic wedge with a closed tip height of 3/8" opening to a full 4". The wedge provides the compact size needed to obtain entry thru small openings. The redesigned wedge incorporates an new internal spring design to rapidly retract the ram in any position. The Wedge combines small size, light weight, rapid opening and closing with heavy duty spreading capability in a 3.75 lb. tool with 3/8" closed jaws which open to 4" and a surface contact area over 3 sq. in. per jaw providing a massive 1,500 lbs. of spreading force at the closed tips. The Spreader has also been redesigned to include a fast acting internal retraction spring located in the cylinder. The redesigned arms have a closed thickness of 5/8" opening to 11", providing over 6 sq. in. of surface contact area per jaw, with over 2,000 lbs. of spreading force at the closed tips. The spreading force increases the farther the jaws are opened. An ergonomic handle has been added to the spreader for easier placement and better tool control. The recently updated pumps, spreader and wedge have an unprecedented lifetime warranty against material and workmanship defect. 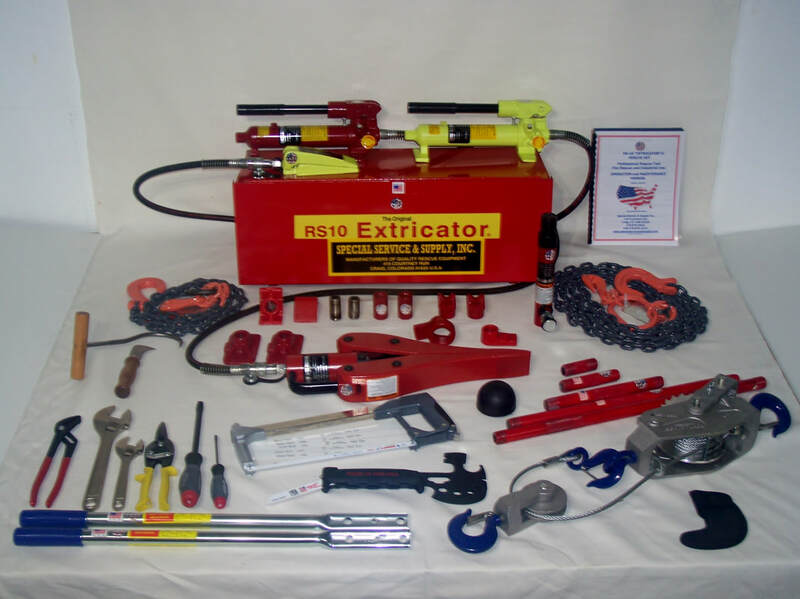 The updated RS-10 Rescue Tool Set includes a completely redesigned, upgraded and improved hydraulic straight ram. The new 5 ton straight ram provides the same compact size and stroke as its 4 ton predecessors and has an unprecedented lifetime warranty against material and workmanship defect. The 5 ton Straight Hydraulic Ram has many new features, including an internal precision wound steel spring providing fast and complete retraction of the ram even with the cylinder in a horizontal or inverted position. A precision machined and burnished cylinder bore are provided to extend seal life and improve spring retraction rates. High quality specially designed seals are used to provide long life and optimum performance. The heavy duty piston retaining ring prevents blowout and eliminates deformation. We utilize heavy duty bearings designed to resist side load and prevent galling to provide years of trouble free operation, The new 5 ton straight ram provides the same compact size as their 4 ton predecessors and has an unprecedented lifetime warranty against material and workmanship defect. The 5 ton ram with 5 1/4" stroke and supplied attachments is designed to lift heavy loads, stabilize loads, raise the dash, move clutch and break pedals, seats, door posts and push metal within the vehicle to free trapped victims. The 5 ton Straight Ram, with included attachments, may also used to lift or spread heavy objects in machinery releases and structure collapse situations or provide structural support for shoring during confined space and other rescue operations. The ram attachments include a rubber flex head, for use on irregular or curved surfaces, 2 flat plates for pushing, 2 redesigned wedge type spreading tips which provide unequaled spreading force, a serrated saddle, a ram toe and a plunger toe designed for offset straight lifting, 2 female connectors for attaching ram extension tubes, 2 male connectors attaching the flat plates, rubber flex head and serrated saddle and 5 heavy duty ram extension tubes in 3", 5", 10", 18", 23" lengths. The ram extension tubes now have large knurled surfaces designed to provide the operator with a better grip in wet conditions or slippery conditions while wearing gloves. The C-2A, 2 Ton Rescue Come-A-Long™, frequently referred to as a cable puller, or a hand winch is designed and constructed to meet the rigid specifications of, and approved for use by EMERGENCY SQUAD TRAINING INSTITUTE, inventors and designers of the highest quality, American Made rescue and extrication equipment. This heavy duty pulling and lifting device is designed and specially constructed to meet the demanding requirements of extrication and rescue. The C-2A, 2 ton Rescue Come-A-Long is manufactured, utilizing a high strength USA made cast aluminum alloy frames with stainless steel springs, lubricated for life bearings, extra flexible galvanized steel aircraft cable, 360◦ swiveling, AISI 5140 alloy steel hooks with safety latches for positive load engagement greatly surpass the acceptable 4:1 industry standard. Three different hook options are available. All C-2A Rescue Come-A-Longs are manufactured in the United States to stringent ISO 9001:2008 Standards, and ASME/ANSI Standard B-30.21. C-2A, 2 ton Rescue Come-A-Longs are non destructively factory tested to 150% of rated working load capacity unlike our competitors who only test to 125% of rated working load capacity. The unique ball-shank terminal securely anchors the cable to the drum so you get full use of your cable length. The C-2A, 2 ton Rescue Come-A-Long is a heavy duty rescue tool designed for the demanding requirements of professionals. This precision tool with tolerances to .001" is not to be confused with imported or stamped hardware store type Come a long! Marine Grade 2 ton Rescue Come-A-Longs, Model C-2AM, are available as an option. The Marine Grade Rescue Come-A-Long provides the same operation, capacities and standards as the Model C-2A Rescue Come-A-Long and includes anodized aluminum alloy castings, zinc plated steel and copper components, 133 strand, aircraft cable constructed of 302 stainless steel to provide for long life under adverse conditions. The proprietary, quickly reversible, handle switches positions in seconds, allowing for a downward pull when lifting or moving an object or load. The handle may be inserted into the bale from either direction, permitting easy access and operation in tight places. The handle can be easily removed to prevent tampering with the hoist or load. The easily replaceable handles are designed to bend prior to the hoist being overloaded to the point where the hoist is damaged. Two handles are provided with each hoist to allow rapid handle replacement once an overload condition is corrected. Model C-1, Rescue Chain Set™, is comprised of two specially designed high strength chain slings, constructed from Grade 100 chain and Grade 100 attachments to form a 5 foot 5 inch long chain assembly and a 12 foot long chain assembly. Each chain assembly is constructed of a special herc alloy, heat treated 9/32”, Grade 100, highly flexible, high carbon alloy chain with Grade 100 forged alloy steel rings and hooks. A chain and attached master link, rings and hooks is referred to as a chain sling. All of the components must be of similar ratings and the assembly is rated to the capacity of the weakest component. The 12 foot chain has been designed with an oblong ring located adjacent to the adjustment hook for easy identification, while the 5 foot chain has a round ring located adjacent to the adjustment hook. The large ring on the long chain sling and the small ring on the short chain sling provide easy length recognition and determination. The specially designed length adjusting grab hook and ring assembly are utilized in shortening the chain assembly thru consistent attachment and length adjustment to achieve the desired working length. The specially designed grab hook allows the excess chain to hang out of the way of the working length of the chain. Each chain sling is equipped with a permanently attached identification tag with individual load test data and chain serial number. The accompanying American Made small hand tools include, adjustable wrenches, pliers, screwdrivers, hacksaw with spare blades, knife, bale hook and Survival Axe® with harness cutter, glass breaking point, metric and ASE sockets are essential component of this set. These tools are the most commonly required hand tools for auto extrication, industrial release and rescue situations. “The RS-10 Rescue Tool Set” contains all the tools most frequently used and necessary to gain entry, break glass, cut, move and remove entrapping objects to free the victim by spreading, pushing and pulling material in multiple directions at the same time as illustrated below. The RS-10 Rescue Tool Set is designed for use in vehicle and aircraft rescue and entrapment situations to free and protect the victims utilizing the process of removing the entrapping vehicle from around the victim by providing you with the ability to open jammed or damaged doors, move seats, raise dashboards, move or raise clutch and brake pedals using the Spreader and Wedge in combination. 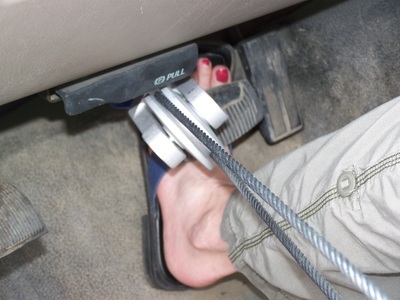 The Come-A-Long and chains are used to pull seats, doors, steering columns, brake and clutch pedals and to roll dashboards and quarter panels out of the way. The five ton Straight Ram and attachments are used to raise heavy loads and the dash, move pedals, push seats and entrapping metal within the vehicle to free trapped victims. The five ton ram with attachments is also used to stabilize vehicles, raise the roof on crushed vehicles or lift vehicles and lift, spread or move other heavy objects. 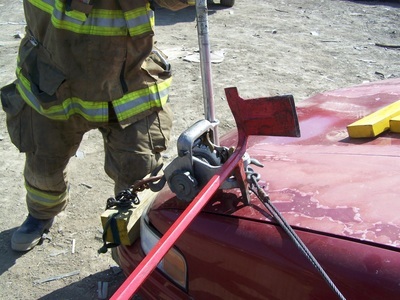 The Survival Axe® is designed to create an opening in doors for wedge and spreader access, cut sheet metal, break windows using the glass breaker, cut seat belts using the internal webbing cutter. 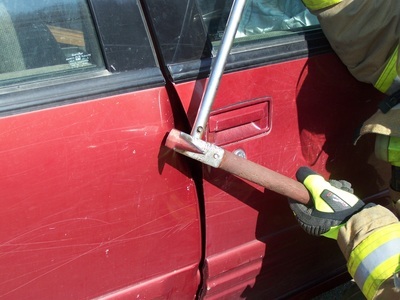 The included small hand tools are the most frequently needed hand tools for vehicle extrication and industrial rescue situations, providing additional glass breaking, window removal, metal, wire and seat belt cutting tools, screwdrivers and wrenches needed for gaining rapid victim access and removal. Shipping weight 150 lbs. Ships via FedEx Ground ®. 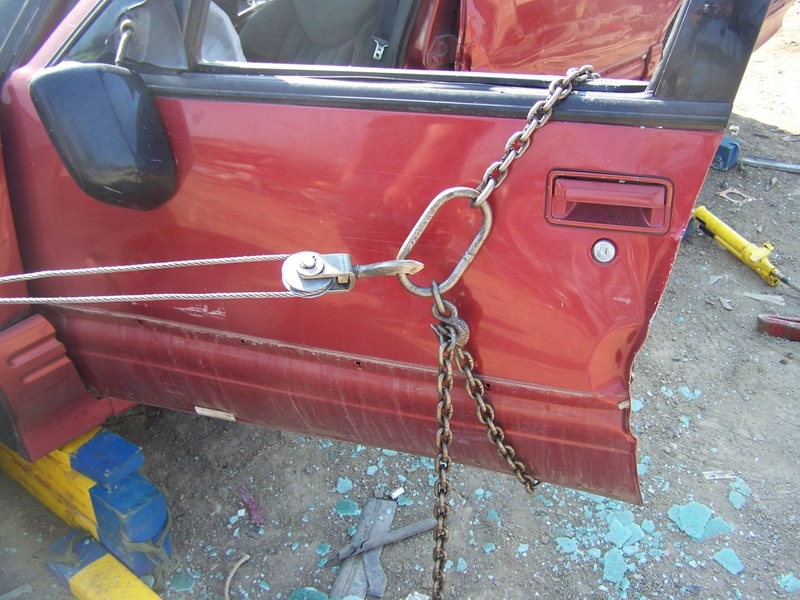 Chains, F-1 Bar, and Come-A-Long set up for pulling a door open. Come-A-Long and chain used in combination to pull a door open.